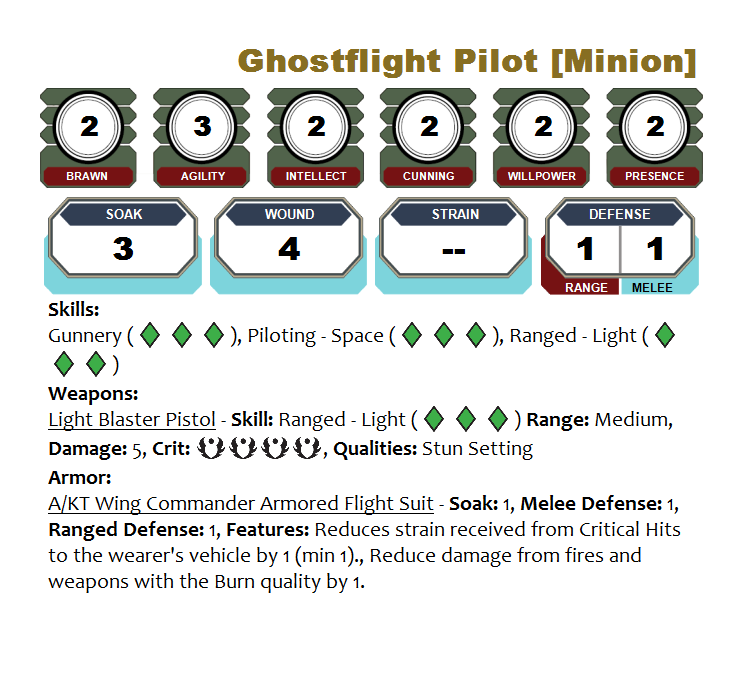 The Ghostflight Pirates are a secretive and vile group of pirate scum that preys upon honest transports and couriers in the hyperspace trade lanes. Like many in their profession, they try to minimize Imperial interest in their activities going so far as to brutally murder most of their captives and turning the rest into slaves. Their primary sources of income include piracy, the sale of narcotics, and the slave trade of their victims. They were created by Captain Rath Torsin during the period after the fall of the Republic and before the Galactic Civil War. Taking advantage of the fear of his fellow smugglers and tramp steamers, he parlayed his extensive criminal contacts into a small and profitable piracy scheme. 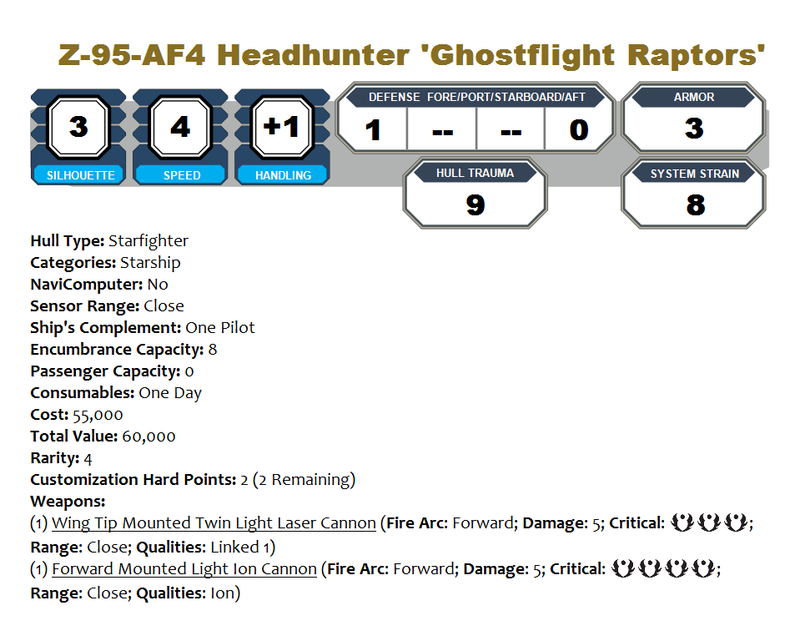 Most of his fences and slave buyers do not have any idea that the Ghostflight Pirates even exist, and he wishes to keep it that way. He explains the goods as stolen, smuggled, or salvaged when he is asked. Very few of his contacts would even believe that the jovial and gregarious transport captain is actually a ruthless pirate. Captain Rath Torsin (formerly Silias Svung) is a canny and ruthless pirate and entrepreneur. The hidden headquarters, operation methodology, and crew complement were all of his creation. He acquires scoundrels and nasty thugs with a potent combination of blackmail, threats of physical violence, and the promise of illicit vices. Captain Torsin works with a computer hacker and blackmail artist nicknamed “Surge” to acquire new potential recruits and victims. While Captain Torsin is away making deals and pirating space vessels, Braxis Kreig controls the planet and the base’s security in his stead. Formerly an Imperial Soldier before he was cashiered out, Mr. Krieg is an extremely large and burly human with an extremely nasty disposition and an even nastier sense of humor. Scars from edged weapons, blaster fire, and burns cover much of his body and he wears them as badges of honor. While he is unnerved by Captain Torsin, he believes that is much better qualified to be in charge of the entire operation and not just Zinneon III. 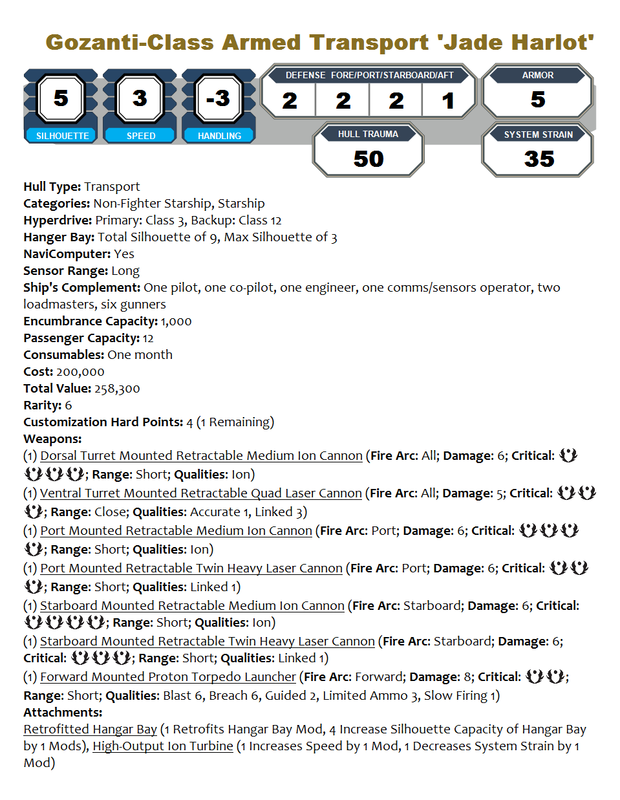 The Jade Harlot is a heavily modified Gozanti Armed Transport owned and operated by Captain Rath. It gets its nickname from the bright metallic green color that covers most of the ship. This coloration is actually another front, as the true exterior is painted a bright white and uses a system of lighting to disguise the vessel when committing acts of piracy. While most authorities scoff at the idea of an old and ungainly Gozanti Transport being used for piracy, Captain Rath loves the anonymity it grants him. His common tactics are to offer his assistance to a lightly armed transport, get close and only strike once they are well outside monitored space. The poor maneuverablity of the Jade Harlot is easily compensated by deceit and the hidden Z-95 Headhunters in the hanger bay. The headquarters for the Ghostflight pirates is the planet of Zinneon III, an unpopulated world on the Trellen Trade Route. The entire planet is shrouded in the metallic debris of an ancient star ship battle and a strange electromagnetic field. The pirates use this to help shield their headquarters from prying Imperial and bounty hunting eyes. The headquarters is a small 4 square kilometer compound surrounded by a large fence, they hide all of their vehicles and most of their activities within an underground base of operations on a large island near the equator. Only a farming compound complete with granary, slave barracks, and fields are easily visible. They often keep several star fighters under camouflaged netting above ground when there is not enough space in the hidden hanger bay. 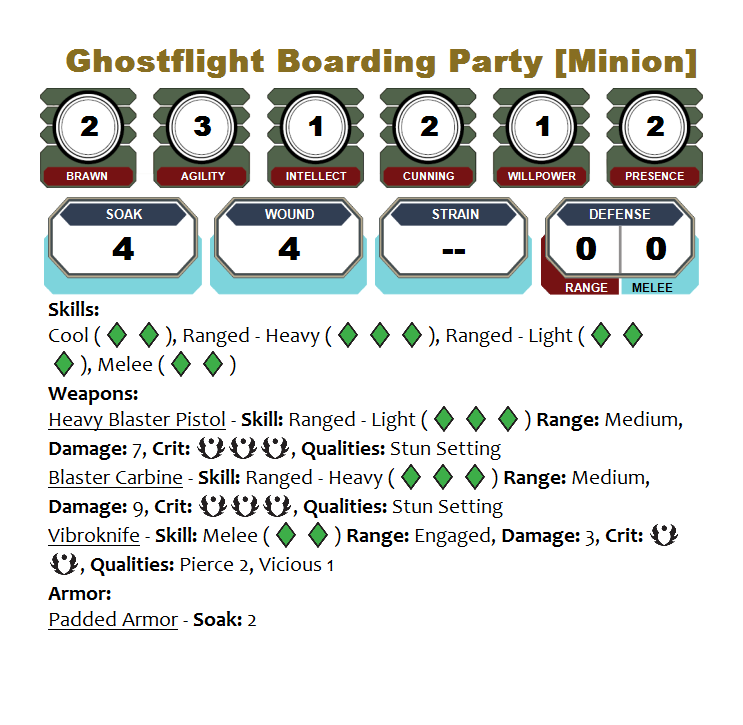 The Ghostflight pirates were intended to be a recurring set of foes for my Silk & Durasteel chronicle. Braxis Krieg in particular was designed to be very tough to kill and a thoroughly rotten villain. Give him a traditional obscure “death” or have him “taken out of combat” mysteriously ala FATE. Then resurrect him with a few more skill ranks or cybernetics to explain how he survived. Captain Torsin is a very canny and unscrupulous man who uses his intellect to get what he desires. Treat him as a very rational, intelligent, and above all careful opponent. He only attacks personally when he has the upper hand, and usually has a backup plan. Or two. With one in a hidden pocket of his coat. Click here for a .zip file of the NPCs and Vehicles for use with OggDude’s Character Generator. 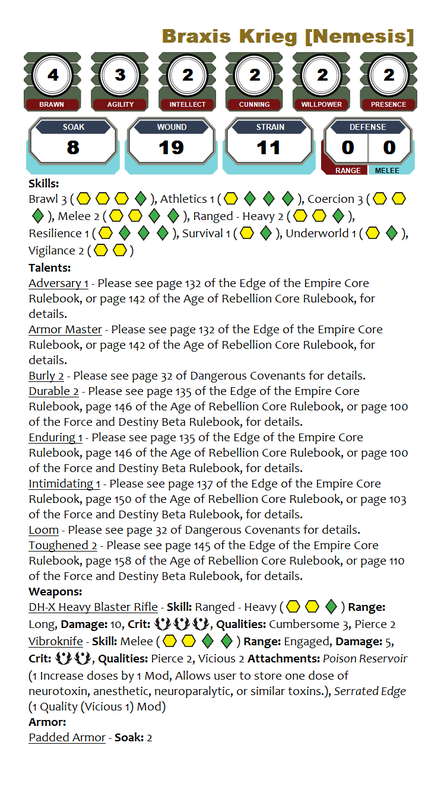 This entry was posted in AoR - Age of Rebellion RPG, EotE - Edge of the Empire RPG, Expanding Universe, FaD - Force and Destiny RPG and tagged Age of Rebellion, AoR, Campaign, Chronicle, Edge of the Empire, EotE, Expanding Universe, Fantasy Flight Games, FFG, FFG Edge of the Empire, FFG Star Wars Edge of the Empire, Game Aid, Gamemaster, Games, Gaming, GM, Homebrew, Locations, Minion, Non-player Character, NPC, Organization, Personas, Pirate, Planet, Role-playing, Role-playing game, Roleplaying, RPG, Science Fiction, Star Wars, Star Wars role-playing game, Stat Block, Vehicle. Bookmark the permalink.